What’s in a name? Eglantyne Jebb and Seraphim of Sarov might just have some theories on this question. The twelfth battle of the first round pits a 20th century English laywoman against an 18th century Russian monk. In yesterday’s action, Dymphna played cat and mouse with Gertrude of Nivelles before prevailing 58% to 42%. She’ll face the winner of John of Beverley vs. Martin of Porres in the Saintly Sixteen. Eglantyne Jebb didn’t care much for children. This is ironic, as Jebb founded Save the Children, an international non-governmental organization that promotes children’s rights, provides relief during crises like natural disasters and armed conflicts, and helps children have a healthy start in life in 120 countries, according to its website. “It is a judgment on me for not caring about children that I talk all day long about the universal love of humanity toward them,” she said. But Eglantyne’s story goes to show God can use us in unexpected ways. God can call us to join in the work God is doing all around us, to respond to needs unique to our time and place. In 1918, while others were celebrating the end of World War I, Eglantyne was protesting the impact of the Allied blockade after seeing newspaper photos of starving children in Germany and other European countries. She was born into a well-to-do British family of strong women who worked to meet the needs they saw in society. Originally, she studied to become a teacher, but she called it quits after a year because of that not-caring-much-for-kids thing. She became involved in the Charity Organisation Society and later traveled to Macedonia to report on refugees. Those experiences revealed to Eglantyne the difficulties faced by children in poverty and in crisis around the world. Eglantyne was arrested for protesting—for handing out pamphlets in London with moving images of those children. Her trial made her famous, and while she was found guilty, the judge publicly gave her the money to pay the fine. That money became the first donation to Save the Children. The organization was the first to take out full-page newspaper advertisements to promote its work and the first to enlist celebrities to promote its cause, according to Jebb’s biographer Clare Mulley. That’s something you can thank her for the next time you hear Sarah McLachlan’s voice with pictures of Precious Moments-eyed puppies. Save the Children campaigned for the Declaration of the Rights of the Child, which later was adopted by the United Nations, and the organization continues Eglantyne’s unlikely work today. The Church of England remembers her life and service each year on December 17. Almighty God, you appeared before Moses as a burning bush and in the heart of your servant Eglantyne Jebb as a white-hot flame: Encourage us with the same fierce and fiery spirit to defend the least, the lost, the lonely, and especially children in distress, that we may ease their burdens and live into your love and will with childlike faith; through Jesus Christ, our Lord and Savior. Amen. 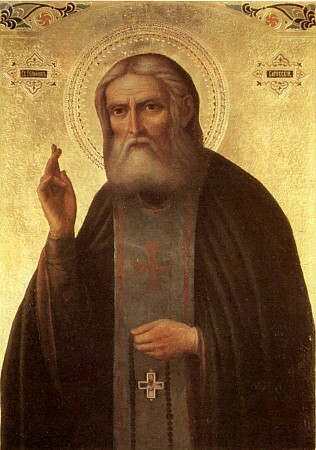 One of the most well-known saints in the Eastern Orthodox Church, Seraphim of Sarov embraced the Holy Spirit and expounded upon monastic practices of contemplation and self-denial. Born Prokhor Moshnin on August 1, 1759, Seraphim became quite ill at age ten and saw in a vision a promise from the Virgin Mary that she would heal him. A few days later, he was brought to an icon of Mary that was known to have healing power. Shortly after touching the icon, he became well. His interest in the church continued to grow, and in 1777, he joined the Sarov monastery. His mother supported his entry into the monastery and gave him a copper crucifix that he wore his whole life. In 1786, he became a monk, and seven years later he became a monastic priest. Seraphim is known for his asceticism. He only ate one meal a day and fasted on Wednesdays and Fridays. One of his notable feats was praying for 1,000 nights with his arms outstretched. Shortly after becoming a priest, he moved to a log cabin in the woods and lived as a hermit for twenty-five years. When wild animals came to the hermitage, he would care for them. One time, he was seen feeding a bear from his hand. At one point Seraphim was attacked in the woods by robbers. They beat him but he did not resist. They left him for dead. They found nothing but his icon of the Mother of God of Deep Devotion. Although he recovered from the assault, Seraphim walked with a hunched back for the rest of his life. When the robbers were caught and being tried, Seraphim asked the judge for mercy on them. He later would say, “Acquire a peaceful spirit, and thousands around you will be saved. He returned to his cabin in the woods, and many people made pilgrimages to him for healing and to hear his prophetic words. Seraphim would often answer their questions before they were even asked. Seraphim of Sarov died kneeling before an icon of the Theotokos—Mary, the God-bearer—on January 14, 1833. Almighty God, you have surrounded us with a great cloud of witnesses: Grant that we, encouraged by the good example of your servant Seraphim of Sarov, may persevere in running the race that is set before us, until at last we may with him attain to your eternal joy; through Jesus Christ, the pioneer and perfecter of our faith, who lives and reigns with you and the Holy Spirit, one God, for ever and ever. Amen. 223 Comments to "Eglantyne Jebb vs. Seraphim of Sarov"
I voted for Seraphim because he forgave the robbers who beat him up. Me too Oliver and also because he fed a bear out of his hand. I also voted for Seraphim of Sarov because he was a Wildlife Rehabilitator. Amen Oliver. Same for me. And he didn’t fight back, did he, Oliver? If that’s not turning the other cheek, I don’t know what is. Without forgiveness there can be no peace. Acquire a peaceful spirit, and thousands around you will be saved. I voted for Seraphim, too. We shouldn’t start overlooking the hermits in our lives. Oh! Oliver. You are such a wonderful kid! I agree. I did too, Oliver. Forgiveness (renouncing revenge) is so very important to our spiritual life and our world today. I am only sorry that all the historic saints seem to be losing in the vote count this time. But it is important to vote anyway, make your voice heard and be gracious whether you win or lose. I’m voting for Seraphim, too, partly because of his saintly, forgiving, and gentle spirit and partly because he has no chance against Eglantyne. This was a difficult choice for me. Eglantyne’s passion for saving children, whom she didn’t like very much, is a true example of devotion and sacrifice. Important to the Orthodox Church means that sometimes you vote to be more ecclesiastically open minded. Seraphim please read him before you vote! However, I had to vote for Eglantyne and Save the Children today. Eglantyne for me today. While Seraphim’s faith and devotion are commendable, he lived as a hermit and people had to seek him. Eglantyne’s faith sent her out into the world and she heeded God’s call and direction even though she wasn’t all that fond of children. She was born to privilege, but used it to the benefit of others. I don’t think we should attach more value to the work of the person who goes forth into the world. Seraphim gladdened God’s heart through his devotion, and for the people who sought him out, I am sure that the seeking was part of their journey to deeper knowledge and love of God. Indeed if Seraphim had tried to seek them out, they may well have rejected him. She was so inspiring…truly taking the love and light of Christ to those children in such dark circumstances, then taking their plight to the world to shine a light on what the world must do to help them!! I mean, The United Nations, for Heaven’s sake!!!(literally). I agree Jane! It was a hard choice but the fact that Eglantyne allow compassion to over her aversion to children swayed me. A good example for examining our own prejudices and learning to allow our love and compassion over come it. A much needed lesson for our day. God bless Eglantyne for embracing the most marginalized among us. agree with another Jane! She came from “a family of strong women”, she saw a need, she met it! I have seen the work of Save the Children at work in El Salvador so had to vote for Eglantyne because her work continues today. Also she is a good example to us of getting involved in issues of our day and not to ignore the terrible situations around us even though it is uncomfortable to do so. Yes! Could not have said it better! Eglantyne inspires me and gets my vote! Before we adopted our four children, we supported children through the organization that Eglantyne Jebb founded. I hope others will do the same (support the organization, not necessarily adopt four children, although that’s fine, too). I’m always for saving the children. Eglantyne Jebb did not find working *with* children to be much to her liking, but she did work tirelessly *for* children. She persisted in showing Jesus’ love for the children, and for someone with an avowed dislike for them, clearly showed an amazing empathy for their needs. Truly, God does move in mysterious ways! (I loved that a Judge who felt compelled under the law to find her guilty and fine her felt equally compelled to pay her fine as a donation to her cause – a greater miracle is hard to imagine!) As much as I may admire many monastics, her actions have my vote today! Onward into the mission fields! I get the feeling Moses wasn’t that fond of Israelites either. My daughter works for Save the Children, how could I not vote for Eglantyne? And how amazing to spend your life devoted to working for those you really didn’t care for!! Eglantyne was a champion for the children. Her work continues today!! A very religious hermit or the woman who was fined for trying to save starving children yet inspired the judge to pay her fine and went on to found an organization that has helped millions of children. No contest! I had to go for Eglantyne and Save the Children. Like her, I taught for one year before realizing I didn’t care for children much either (on a personal basis). I am a big fan of programs that ease child suffering – Save the Children, St. Jude’s, and more. Nothing is more heartbreaking than the suffering of a child, and it is heartwarming to see someone with privilege use it for such good works. I especially appreciate those that are willing to be arrested for their principles, and shout out to the judge that paid her fine. How cool was that? So despite her works being the origin of those tear-jerking ASPCA commercials (I have 6 adopted pets – I’ve done my job – leave me alone Sarah McLaughlin!) I had to give her my vote. June……I love your comments! I, too, was a teacher originally but never very gooey-eyed about babies or children. I ,too, have adopted 7 cats(at different times) and can’t bear to watch the ASPCA ads. Eglantyne was English like me and I was fascinated to read her story and hear of the wonderful organization she founded. Eglantyne’s story reminded me of what another (probably well-off) woman said about children: “I love little children, especially when they cry, because then someone comes and takes them away.” Eglantyne did a wonderful thing for children anyway. Does that mean you don’t like little children? What about your new grandchild? I liked Seraphim bc he set his mind to something and did it. And Eglantyne didn’t like children so we couldn’t vote for her. Eglantyne. Sometimes teachers need models of care and advocacy for children (who may or may not be particularly likeable) in spite of one’s personal feelings about them. As a former Labor ad Delivery Nurse turned teacher of religion/lay chaplain and science teacher to children in ages Preschool–5th grade I have to vote for Eglantyne despite her un-pronouncable name! No, no, don’t jump, just wait 22 seconds, and once you know the answer I dare you to stop before the end! Thanks so much, Susan, and how did you do that? Not by witchcraft, I trust! Hahaha! I’ll never tell! I’ve been singing it since I first saw the bracket! Terrific! Thank you! I knew how to pronounce it but this was just a treat! Thank you for sharing the video clip. LOL! Love that movie, and as soon as I saw this saintly match-up, that song started playing in my head – Eglantyne, Eglantyne…..
Fabulous! Thank you from me too! Very charming use of the library equipment for the dancing routine! Is the lady Angela Lansbury? I can well see why the poor man is smitten! While in high school the students supported a child from Save the Children. Followed that way after marriage for many years. Eglantine’s has my vote. As a teacher and advocate (I hope) for children, I thought Eglantyne would be the one for me. The ASPCA snark was unnecessary to her biography, and made me think twice. My Lenten study group have so many causes we care about, and so many problems we try to be praying thoughtfully about that it becomes overwhelming. So I chose Seraphim, and am trying to “acquire a peaceful spirit.” That may include a donation to Save the Children, by the way. I like your combination action, Sara, and think I may follow. Despite the heartstring pull for Eglantyne’s story, the Spirit led me to click Seraphim for the vote, but my next donation could go to Save the Children. I agree with you, Sara, about the ASPCA snark. Sometimes people who advocate for abused and neglected animals are subjected to “What about?” “What about the children, the poor, the sick…” as if it is somehow wrong to care about animals as long as one of our own species is suffering somewhere. Self denial- Does That mean obeying the ten commenments and denying adultery, false gods, etc than great. If that means hurting your body by denying its needs or physical hurt to self than I can not understand how that is a good thing. I think it usually means, primarily, not reacting to your own self-preservation instincts first and foremost, and not easily giving in to your appetites. We all do it to some degree, whenever we think, “But am I *really* hungry, or do I just want to eat?” or don’t buy something we want but don’t need, or let someone go ahead of us in line, etc. Both were important and did good deeds but, for me, Save the Children won out. Eglantyne got my vote today. You must run the race set before you…….sometimes the race is a hard one in this life and in Seraphim’s time……….am in need of that peaceful spirit! Seraphim for me today! Seraphim has been one of my favorite saints for years. He is, what I call, a “rustic” sort of saint. This was a hard one. I had to go away and cogitate for awhile before choosing Eglantyne because of her concern for refugee children. I had to vote for Eglantyne. I feel that white hot- flame burning for justice. We need a little righteous indignation in these times. Well put, Gillian. I voted for Eglantyne for the same reason. The thought of someone who didn’t enjoy working with children being called to work for children is pretty awesome to me. Though Seraphim is a wonderful and worthy saint, I had to go with Eglantine. A hermit monk who only counseled those who trekked to him vs. someone who went all over to assist children in need? Incarnation theology wins — no contest. When presented with a choice between being and doing, we often discount being. What I love about Seraphim is that he realized that caring for our being matters to our doing. Both saints today are commendable, but as one whose work as a spiritual director is soul care, I chose Seraphim. Imagine what could happen in our world if more people took seriously the need to acquire a peaceful spirit. The needs of all would be provided for. Agreed. I’m going to guess that the Lent Madness Global Voting Public will go for doing over being, but today I need the contemplative and peaceful too. I feel bad for Seraphim having to go up against Eglangtyne. Both are commendable, but I have to go with Eglangtyne. Her work lives on in the world today. “Don’t feed the bears.”. Besides, what happened to the copper cross when he was beaten? Did they leave it behind with him? And what true monk keeps personal possessions? That’s funny because I thought the same. If he wore the cross his whole life, where was it when he was robbed? I voted for Eglantine in large part because of the write up by our celebrity blogger. You had me at the opening with the mention that she didn’t like children, but founded the NGO Save the Children, and gave up teaching after a year because of the whole “didn’t like children” thing. Her story is a testament to God using us for God’s purpose despite ourselves. Being a not-so-crazy-about-kids person, but for all the work she did for them I went with Eglangtyne. Also, I totally agree with Jane (8:20 am) – she went out to do the work of God, not camping out as a hermit for 25 years! I’m a layperson, but I know a lot of priests (and monks, for that matter). So it really cracked me up that Seraphim became a priest, and then became a hermit. Having worked in several churches, I kinda get it! While I’m in awe of Seraphim’s devotion and don’t consider the active life necessarily superior to the contemplative, Sreaphim’s life just doesn’t much move me, while Eglantyne’s moves me greatly. Today my emotional response will guide my vote. As I was reading Seraphim’s bio I was overwhelmed with a Valley Girl feeling of, “Gag me! Really? OMG! Give me a break!” Perhaps it was because I had just read Jebb’s bio, so very inspirational. But then, I wondered how his choices formed his spirit to be at one with beasts and robbers. That is truly transformational. When I read about Jebb I thought she’s be my choice no matter what. But when I read the “Acquire a peaceful spirit…” quote, it lept out at me–hightlighter-like–and I knew that was what needed to be spoken again, especially in our time. So, the ascetic hermit wins for me today. May thousands upon thousands be granted the Spirit of peace, and keep on spreading it. My kind of evangelization, too! I voted for the Seraphim too. Perhaps it was because I recently finished the book Godric by Buechner. The book made me laugh and cry but mostly cultivated a new respect for the aspirations and devotion of a hermit. Certainly quite commendable that Seraphim’s spirit drew the public to him. This seems like a gender versus gender year and the women keep winning. I’m a little disappointed in the seeding. I noticed this too. Feels like it lacks discernment here. Like beauty discernment is in the ey of the beholder! Eglantyne Jebb because even though she was a character on The Beverly Hillbillies show, she put her best effort where her heart wasn’t. Gotta go w/the kids benefactor. After reading all 64 Saint bios, I had pinned my hopes on one of Lent Madness’ stellar nominees, Peter Claver, to go all the way. That he lost in the first round left me reeling, not that his opponent was undeserving. But is this an America first contest? Here we have the estimable lives one British and one Russian saint. Of course both have merit. I am attracted to the more complex case of Eglantyne. She was no goody-goody, but Save the Children is a great legacy: she really worked to make the world a better place. What a tough choice! On the one hand, the White Flame and her work for the least of these (“for in this world they have no voice/they have no choice”). On the other hand, Seraphim for his commitment to nonviolence. Certainly his asceticism is unappealing to us now, but consider the time and place he lived. For us to know about him today, his life must have had a huge impact on those folks back in the day. Nice to see a brother from the Orthodox tradition on the bracket! Oh, great lamentations in the Hauser haus today! How shall I decide? 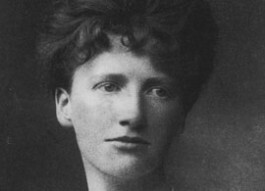 Eglantyne Jebb. Now that’s a name I’d like to see people saying they’ll give to their cat. God has a sense of humor and chose Eglantyne to care for those she didn’t care much about. Good for her for watching and listening to God’s call. Voted for Eglantyne partly because of current events. Save the Children is now under scrutiny for its handling of “inappropriate behaviour” on the part of two male executives, and debates as to whether the UK should continue its financial support for Save the Children is happening in the Westminster Parliament week after week. Loss of funding for this charity would be tragic. Voted for Eglantine, donated to Save the Children. As for Seraphim, my devotion to Orthodox faith and spirituality would normally have carried the day; this is a rich tradition to which Episcopalians owe a great deal. My partiality may owe something to my visit to Russia (then part of the Soviet Union) and observed the church there under state persecution, but devotion to Russia has run deep in my family for several generations, so there’s that. As a retired developmental pediatrician, I spent my career advocating for disabled children (and adults, too). Who knows what kind of children she taught? That wasn’t discussed. She may have faced some very challenging children who would try a saint. Eglantyne, no contest. I suspect that few people actually like other people’s children very much, but fortunately most people like and love their own. I knew even before I cast my vote that Eglantyne (such a great name!) was going to win. And there is much to admire in her. I doubt very much that she disliked children; rather, I think she was a woman “in the day” with strong managerial skills and no societal/economic outlet for them. Nevertheless, she persisted. She is a beautiful Eg in our Easter basket of saints. So I am giving a nod to the hermit/prophet and to the theotokos icon he was devoted to. Seraphim recalls to us the fathers and mothers of the desert in the early church, who vied to be the most ascetic and who attempted to embody the sufferings of Christ in order to be saved. Again, this sort of “athletic” self-denial is alien to our way of thinking today. Also the veneration of icons. And yet I am thinking that we (as a society) are giving some very powerful images to the world and to our next generations of death. I would place the images of the women’s march against the images of people running from shooters. We are all being asked to choose what we worship. Seraphim (named for the highest angelic order) chose to gaze on the mother of god and tackle the aggression in his own heart in order to sow a seed of love for an aggressive, violent culture. Both versions of sainthood are necessary, but today I want to support Seraphim and the spiritual resources of the eastern churches. Thanks as always for your thoughts. That’s where my heart is moving, too. So I’m wondering if you were an English, theology, or psychology major . . . The people running, with sorrowing angels as in many images of the Crucifixion, would make a moving icon. Maybe with the Mater Dolorosa looking on, as a focus for devotion. There’s an iconographer in Orvieto who might actually be interested in the idea. I’ll mention it the next time I’m there. Can I put in an order now? I’m voting for Seraphim because the eastern church gets regularly neglected. Also, because of the gorgeous icon of Seraphim that we are treated to this morning. My daughter and I were both born with fiery spirits, which we find are both gifts and stumbling blocks in our lives with others. I am enjoying taking mental breaks while gazing at Seraphim and thinking, “Acquire a peaceful spirit, and thousands around you will be saved.” I doubt our spirits will ever be consistently peaceful, but to be able to summon peacefulness when needed would be a blessing. I am voting for Eglantyne but remain concerned over our faith. I vote for her because some force moved her to help. My concerns are simple, based upon Eglantyne’s elevation to Sainthood, when will we start accolades for Bill and Melinda Gates or Microsoft. Assume you’re being ironic. I believe Jesus would say they have been well paid in public acknowledgement for their charity. Their left hands know very well what their right hands are doing. The poor widow’s mite is worth more in God’s eyes. Beautifully put, St Cecilia. It would also be a strange and tragic thing indeed if those who did good were all considered worthy of sainthood, as though doing good is something that we aren’t all capable of and called to do. And why should those who have a great deal of money to do good be held up above those who have nothing and invisibly do good every day. I voted for Eglantyne. Her working with children even when she wasn’t fond of them struck a chord with me. Also, giving credit to the Virgin Mary instead of God for healing is a theological issue for me. What a lonely world it must be for God never to be able to share credit with anybody for anything. We give credit to surgeons for healing us. Why should not theotokos be given credit for healing when the apostles were given credit for the same? Can we not allow any feminine element to God’s nature at all? Every time I start to reply, “But that’s not a gender issue,” a small voice says, “Whoa.” So I’m making some progress, at least. It’s not easy for an old white male to get woke, I must say. Davis, your comment warms my heart. Thank you for sharing that! I respectfully disagree that it’s a gender issue. I can’t speak for S.R. Niccolls, but I suspect it’s a veneration of saints issue. Some are for it, some are against it. For many, giving the (male) apostles credit for healing after said apostles have already gone to their reward would also be a problem. A nice meditation, St. C.
I’ve always imagined Mary as embarrassed by all the attention but putting up with it for the sake of the good it does. St. Celia, it’s true that Mary has become a particular focus (or target, rather) of Protestants in their effort to distance themselves from Roman Catholicism. I see it as being a difference of degree…as the God-Bearer, she is the most invoked saint in the pantheon, and understandably so. This also makes her the most obvious target for those who don’t agree with invocation of saints. I agree that this virulent anti-marianism is sad. However, I would hesitate to chalk it up to simple misogyny, or as you stated, an unwillingness to allow any feminine element to God’s nature. That could certainly be one aspect of it for some people, but it would be difficult to prove given Mary’s unique position among the saints. I know it may have been noblesse oblige but Eglantyne did so much for children. I’m surprised this is so lopsided. Seraphim won me over, even though he lacks a cute theme song. Pushkin? I am impressed. Can you say more? Seraphim’s story made me think of Julian of Norwich, similarly a contemplative who helped many people who sought her wisdom and healing care. He may have been a hermit, but with his “peaceful spirit” brought healing to many. Incidentally, a pectoral cross is a symbol of devotion, not so much a “personal possession”. He had been healed of serious illness in childhood. He forgave those who beat him and left him mangled for life, not an easy thing to do. He is a good model for this retired clergy woman. I cast my vote for him. Seraphim and his peaceful spirit. Much needed asceticism versus much needed actionism. . . what to do? (Ah, DO is the operative for my choice today.) Sing with us ye Seraphim as we raise a toast to Eglentyne. This match is particularly hard for me. While the desire to recognize the value of “doing and lasting” bodes well for Eglantyne the witness of “being” won me over this time. There are many today who “be” as Seraphim lived out his faith. That we don’t know them publicly as we know Save the Children doesn’t diminish their impact that threads through many lives across the world. I go with Seraphim. The saint who took action out in the world speaks to me today. Go Eglantyne! I agree, Megan! It’s not about who’s more worthy, but who speaks to me today. Save the children of Syria, of Sudan, of all the places in the world where there is abuse of power. Ah Seraphim, the monastics get my vote today. Embracing the Holy Spirit did it for me. The life he lived is one I attempt to adapt to modern contingencies. So far I have only missed on one match-up which was between Peter and Paul. Unbelievable. Let’s see how long this streak lasts. I vote for E. Jebb….gotta love a lady who knows her dislike of children is about her and not the kids; and is open to God’s calling to protect the most vulnerable, no matter how pesky they may be! *like* Pawpaw said pretty much the same! I’m no W.C. Fields and I’m not a natural coo-er over kids…so I find kinship with Eglantyne. And like her – God has called me to work on behalf of foster care children & youth here in Los Angeles. “Systemic” love and care matter, too — God in her infinite wisdom has created a place for us to be of service in spite of our natural inclinations. Could not have said it better! I, too, am not a kid person, but I care very much about them and, ironically, have on many occasions found myself championing them despite myself. Eglantyne got my vote. I also recommend Seraphim’s “On the Acquisition of the Holy Spirit” to anyone interested in personal prayer. After reading the comments, adding that Seraphim wasn’t always a hermit. He became a Confessor, welcoming all who came to him and listening to them and advising them. Hoping Eglantyne comes back around NOT up against one of my inspirations! My understanding of the term “Confessor” as applied to the early eastern churches is that it pertained to those who had been tortured for the faith and refused to abjure Christianity (but weren’t killed), as opposed to those who had also been killed, and who were known as the “Martyrs.” I am wondering what the technical term is later for those who heard confession. Perhaps the term “confessor” evolved over the centuries. Just an interesting question. Julian of Norwich was also an anchorite, and she counseled people who came to her cell window. Thank you for posting that, Angela. “We condemn others only because we shun knowing ourselves.” WOW. Thank you for sharing that! That is a very powerful prayer. Need to add this to my repertoire. As much as I admire, and sometimes attempt to practice, asceticism, my vote had to be for Eglantyne. Children in harms way, which is all too common a condition in this country as well as in many places throughout the world, need advocates to cry out for their relief – and do something about it – because they can neither cry out for themselves or do much to protect themselves or escape their situation. I haven’t the time to read all the posts, but has anyone asked why Seraphim (the Hebrew plural) and not Seraph (the singular)? My best guess is that it has something to do with the Russian language; “Seraphim” may be the masculine singular form. From https://bg.wikipedia.org/wiki/Серафим (translated to English via Google Translate): “Reverend Seraphim of Sarovsky (in the world: Prohor Isidorovich Moshnin, according to some sources: Maškun, 19 July 1754 (or 1759), Kursk – 2 January 1833, Sarovsky Monastery) is a hieromonk of the Sarov Monastery, among the most revered Russian saints. Founder and patron of the Dievev Monastery. Glorified by the Russian Orthodox Church in 1903 on the initiative of Tsar Nicholas II.” From here, the article goes on, in Russian, of course. I took the plural as generic, avoiding the suggestion that he himself was an angel. I found todays choice surprisingly difficult. Having worked in a homeless shelter for 14 yrs my heart is for anyone who supports making the lives of displaced children better. (The largest percentage of people experiencing homelessness are children, a fact that the media seems to ignore). That being said, my personality and spiritual journey are much more in line with our brother Seraphim’s hermetical life, so wanted to vote for him as well. In the end I shut my eyes and hit a button- and Eglantyne got my vote. We are commanded to love our enemies, and Eglantyne “protested the Allied blockade” after the end of the war in order to save starving children. She gets my vote, hands down. Save the Children, and save Lorelei. She’s two. She was a premie born with the rare disease Mitochondria. Yesterday was Rare Disease Day. Lorelei’s grandma is friends with Esther Ann who was in my car pool when we were about 6. She has flu for the fourth time in the last 49 days. She was in PICU in FL on vacation. Stopped breathing twice. Intubated and tube fed. She’s a warrior. They made it home to VA. Another flu. Beat it. Now for the fourth time. She sat up for the first time a few days ago. Pray for her. Follow her on Facebook at Friday’s with Lorelei. There’s a link for donations. A researcher is studying her particular strain. She needs a cure, she deserves a cure. Take a look. Please. She’s adorable. Her mom, Suz, is amazing. This family will cause you to give thanks–even if you don’t like children. Lorelei deserves your prayers. Learn about Mito. I voted for Eglantyne. The need for healing is overwhelming. No wonder Jesus did so much of it. Bless your Lorelei. Someone near and dear to me has the very same thing. It is a very hard row to hoe. Recent interest in the history and workings of Orthodoxy led me to vote for Seraphim, even though I was pretty sure his biography would seem the less stellar of the two. Ack! This makes the second day in a row that I’m unable to connect much with the story of either saint. I finally decided on Seraphim, though it looks like few are joining me in that. I do appreciate the fact that he asked the judge for mercy on those who attacked him, and I like his quote: “Acquire a peaceful spirit, and thousands around you will be saved.” I also like his unique status as a hospitable hermit, who welcomed visitors though he remained in his cabin in the woods. And he reportedly greeted his guests with the exclamation “Christ is risen!” He is risen indeed! Eglantyne’s work was admirable, but I’m unable to find anything about a Christian motivation behind it. That’s my basic requirement #1 for a saint. So I’m sticking with Seraphim. I love reading people’s thoughts about why they vote the way they do. Particularly yours today because the reason I selected Englantyne to win the whole thing was exactly because I find her work with Save the Children to fit in completely with my notion of Christianity. There is Matthew’s text about “Suffer the Little Children” afterall. And to me, looking out for those less fortunate and loving our neighbors is so much part of Christianity and Christ’s message. It certainly is, Julie. And I’ve voted for many saintly souls who, motivated by the love of Christ in their hearts, have looked after the less fortunate and loved their neighbors. However, Christians aren’t the only folks who are capable of doing good things like these. People can do good with different motivation, and that’s great too. It’s just that here in LM I think we’re looking at the contributions of Christian saints who did good in Christ’s name, and whose good deeds point ultimately to Him. In the case of Eglantyne, I was searching for even the slightest mention of religious conviction on her part, and found none. I suppose the fact that the Church of England recognizes her contribution means that she was at least a member. But even when I googled her to find out more, I still came up empty there. If anyone can find some evidence in that area from an outside source, I will be most happily proven wrong. Eglantyne for me! She found her niche despite her intolerance for brats. Actions speak louder than words. But to be honest it was her song that sold me. I felt that Dymphna and Gertrude of Nivelles could have been part of the #metoo movement. So far only one of my picks have not advanced. I chose Thomas a Kempis over Maria Skobstova. My bracket is not busted. I think it will be soon. My final 4 is John the Evangelist, Dymphna, Edith and Katherine Von Bora. Devoted to God is important and forgiveness, however the children are always our future and they are the innocent. I had to vote Eglantyne, her work is carried on and still helps our children. I feel blessed that my children and grandchildren have lived in a home where there was enough. I have always thought what would I have done if I did not have enough to feed my own children, That I cannot say and I continue to want to support those that help children worldwide. Seraphim. I think we undervalue a life devoted to prayer at our peril. Paul exhorts us to pray constantly, which Seraphim certainly did, and his prayers were most likely for the rest of the world, including those called to activism. I wish we had more monks and nuns supporting us in prayer, today. I thought it was pretty inspiring that Eglantyne Jebb did so much to help children when she didn’t really like them. I wish more people followed her example of showing Christ’s love to those they don’t really like. I’m not surprised that Eglantyne is winning, but I’m sorry the percentage is so high. I voted for Seraphim — it would be nice for a contemplative saint who ministered to troubled souls one-to-one to get some attention. This means of our 12 contests so far, I have only gone with the winning saint 4 times. Ah well. I don’t fill out a bracket ahead of time, but I do have a prediction at this point. For the Faithful Four on the left side, Peter vs Maria Skobstova. That will be an interesting match-up if I’m right. You’re in good company, Kathy. Good to hear from you again! I’m trying to be “good” this year and not doing Lent Madness until my lunch hour. So my comments tend to be way past 100, and I have no idea whether anybody is reading them. I appreciate your comment! Sure thing. I love reading the comments and reflecting on them. I used to support Save the Children, and wile bouts of poverty prevents me from continuing to support them financially, I am happy to crown its founder with the golden halo! A devotee of Mary, Mother of God, Theotokos. Had to vote for Seraphim. the “great cloud of witnesses” mentioned in the Seraphim collect grabbed me…as I age and come closer to the end of my life here, the great cloud is a comfort to me. Seraphim was not flashy, not seeking popularity, not charismatic but was steadfast and steady. When you devise and implement a program to save and salvage numbers of needy children, it is not mandatory that you like/love/adore them..that’s your personal business. Programs to ensure their well-being and development are the crucial elements. I personally know people who just love and adore children and don’t have a clue about their well-being nor upbringing. Eglantyne gets it today ! She didn’t hate nor dislike the kiddies just wasn’t sappy nor maudlin. Give’er a break ! You don’t have to be personally involved with a cause to appreciate its importance. I can understand the need to care for the earth without living outside in the elements. It was Eglantyne for me. As soon as I read “contemplation and self-denial” in the first sentence about Seraphim, I knew he was going to get whupped. He’s getting my vote, though. I Googled him for more details and learned it was in 1815, after he had a mystical vision, that he opened up his hermitage to visitors. So he spent nearly 20 years sharing what he had learned from his solitude and his previous life’s journey before he retired to the woods. I love the image of people trundling out to the forest for spiritual and emotional counseling and healing from this peaceful and merciful man. Fierce and fiery activists are awesome, but we need the quiet and constant saints too. Ditto. Quiet sounds good – my favorite oxymoron. The Spirit does work in mysterious and compelling ways. Although not enamored of children per se, Eglantyne Jebb ended up with fire in her Spirit to protect them in the face of misery brought on by wars, disease, etc. Today, the Save the Children Foundation is serving in 120 countries (US included) and serves 157 million children worldwide! Not bad for someone who was a former teacher who ended up handing out pamphlets on a London Street in 1918 protesting the Allied blockade. One meal a day, and fasting on Wednesdays and Fridays! Now HE should be the patron saint of dieters. True, I’m more impressed with work and witness of Eglantyne, but Seraphim has spoken directly to my eating habits this lent. I feel like repenting now. Might as well give him my vote, too. Eglantyne—voted for her out of empathy for that name—Actually for the good work! I’m sorry! When I first saw Eglantyne Jebb’s name in the subject line of the email, I thought I saw Eggplant. That’s Ms. Aubergine to you. Seems as if we’re going with saints who are out in the world, actively organizing and improving the lives of others this year over the contemplatives. Perhaps there’s an undercurrent of need. To say nothing of what’s going on in the world today. I wonder how much we are being inspired by movements such as #metoo, the women’s matches and the (frankly inspirational) work of young people post Parkland. I voted for Eglantyne because I work for one of Save’s peer organizations, have many good friends at Save, and know what good work they do. I love St. Seraphim, but guys like him always seem so remote to me. It seems to me that Eglantyne loved children very much but found, when she turned to teaching them, that she didn’t actually like them very much. So she found a way to express her love that didn’t require her to like children personally. They can be little monsters; some people, including many parents on at least certain occasions, find that hard to deal with. Did I miss something? There is nothing in the description of Eglantyne that indicates she had any kind of spiritual life. As a loyal British subject, she might have been a member of the established church but that’s pretty weak tea in the running for sainthood. Is a good track record as a humanitarian now all that it takes to qualify? For his many sacrifices on behalf of all the people of Middle Earth, I nominate Frodo for a run at the Golden Halo next year. Okay, I’m going to joust with you a little on this one. Must one be a Christian to be a saint, or to be a saintly person? Ghandi comes to mind. . . I hate to pop your balloon, but Frodo was corrupted by the ring at the edge of the lava. If his finger hadn’t luckily been bitten off, Middle Earth would be enslaved to Mordor. No ring for Frodo, no golden halo. Next! But Tolkien, now he could be nominated for the golden halo . . .
She was a faithful member of the Church of England, and her Christian faith informed her social activism. I have read sermons that she preached. She was influenced by Gore whilst at university. The children won me over for Eglantyne, but must admit the video was also a plus. I am a retired pediatrician with special interest in infants and toddlers and their emotional development. My heart aches for children in poverty, war torn countries, refugee camps, victims of abuse–all children without loving families and communities to grow up in. I had to vote for Eglantyne. But I have become more aware of the Orthodox Church because my daughter-in-law is originally from Bulgaria. It was hard not to vote for Seraphim. Chaucer’s prioress in the Canterbury Tales was also named Eglantyne. I’m just saying. Amor Vincit Omnia. Unfortunately Chaucer’s prioress had her mind not on agape but on eros. Sad. These British women reformers were very fit: Girl Guides and all. She doubtless did situps and pushups and could hold the “plank” position for a thousand days and nights. Did our emaciated Seraphim (whom I voted for) have a core to match hers? Russian is my second language so I have to vote for Seraphim. This will probably make me 0 to 12, but I’m voting for Seraphim and I’m learning so much about the saints but nothing about going with the flow. Astonishing that she did not care for children, but saw their need and helped them. God does indeed prepare us for his work, not just using the prepared. So glad she saw, heard, and then acted. Bless her. Eglantine went out into the world to find and meet the needs rather than retreat into the woods. I loved the video, too. Having nominated Eglantyne Jebb I can do other than vote for her. A remarkable woman whose work continues to improve the lives of children around the world. A faithful member of the Church of England, she approached the Archbishop of Canterbury asking for churches to donate to famine relief. When he refused, she went to the Pope, who committed the catholic churches to collections thus shaming the ABC into supporting relief work. Way to work the system! Watch and learn, children. I worked with refugee children and saw the work the Save The Children do. I could not not vote for Eglantyne. St. Seraphim is my husband’s saint, and “On Acquisition of the Holy Spirit” by St. Seraphim is one of my favorite writings. So I voted for him. For quite a while I’ve been on the Lent Madness mailing list, but today (March 1) I didn’t receive the email about Eglantyne Jebb and Seraphim of Sarov — I had to go to your website. I enjoy Lent Madness so much. Please put me back on your emailing list. To answer the question posted by the SEC, yes, I filled out a bracket, yes it’s still intact, but no, of course I haven’t been 100% accurate. Come on – Peter vs. Paul was a coin flip (I lucked out on that one) and who knew deacons and their faithful fans wouldn’t help Phoebe advance? I know you can’t reveal your own personal picks . . . but I’d pay $ to see ’em. Just saying. No doubt about it,the lady in question is deserving. However, the anti-puppy comment by the author of the paragraph alerted me to his/her bias against the animal kingdom and to whom I would never, ever entrust the care of a canine or feline, let alone any other member of the non-human population, and that bias led me to vote for the priest hermit without reservation. I had to go back up and look for an “anti-puppy comment.” I believe the comment about Precious Moments-eyed puppies was a tongue-in-cheek commentary about how gosh-darn cute puppies are and how hard it is overcome any appeal that uses them. The larger point was that Jebb’s organization was ahead of its time in using celebrities; Sarah McLachlan and those too-cute puppies are but one example. I would entrust Emily with living creatures; after all, we’re in her hands today, aren’t we? and we’re doing fine. But I can immediately think of a certain bassett-eyed politician whom I would never trust with any human or animal life and would never let Speak in any House I cared about. the women are really cleaning up! Wow, how can you not vote for a guy who could tell you the answers to your questions before you even ask them and was seen feeding a bear by hand? These were both very special people. Not to diminish her work, but I saw no mention of God or faith with Eglantyne or Save the Children. Looks like a secular social worker to me who had broad impact. I could have voted for her if something was said about her faith but there was nothing. Seraphim was a devout healer and prophet. His faith was very apparent. In 2011 as an undergraduate at Southern Methodist University for one of the core courses in my minor in Himan Rights I wrote a 22 page paper on the Declaration on the Rights of the Child and why the two countries that hadn’t ratified it as of that time hadn’t ratified it. Children’s rights are human rights. I’m with Eglantyne Jebb because she persisted. The illustrations for the Lenten Madness use paintings done for St. Gregory of Nyssa in — where else? — California. If you go to the S. Greg of N website you can see the entire painting of the dancing saints, and there is a page with separate descriptions of each of the saints. One of the saints dancing is Seraphim with his bear. He was indeed feeding the bear, but his comment was, “The poor bear doesn’t know it’s Lent.” So the Bear is one of the four animal saintly figures dancing above as the congregation presumably dances below. The guy was obviously a pretty holy guy. His talent for self-torment is certainly remarkable. I like that he went into the wilderness but shared God’s love with the mute creatures around him. I felt respect and affection for Seraphim, and I also felt a powerful reaction to Ms Eglantyne. I feel the same awe I have for Frances Perkins, another noteworthy saint of similar sturdy character in our time. It seems that Eglantyne labored her whole life for the welfare of children, and she was dedicated to her mission in a manner similar to that of Florence Nightingale. This lady could very well go all the way. Nothing is said about her faith, so it would seem that Eglantyne may be a ‘secular saint’ – and God surely uses many to do his work. I can identify with her personal discomfort which did not prevent her urgent compassion toward children. It may have compelled it! And she persevered through ill health to serve when she might have been a social butterfly instead. When we voted for someone who introduced social security we knew she was also committed to God. There is nothing in the bio about Eglantyne that speaks to her godliness. Seriously? So being a fundraiser in itself makes you saintly? I don’t think so. I voted for Seraphim, because of his forgiveness , Remembering Jesus words ” Forgive them , they know not what they do” and his brave care of wildlife. I voted for Eglantyne because she lived and worked in the “real” world. $he faced opposition bravely and took a large step in faith on behalf of children in crisis everywhere. Ms. Jebb all the way!!!!!!!!!!!!!!!!! !